Send the gift of summer at any time of the year! 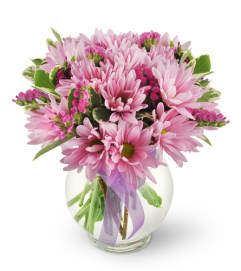 Our bountiful display of dancing daisies is an absolute delight. This all-purpose classic is sure to bring joy to almost any occasion! 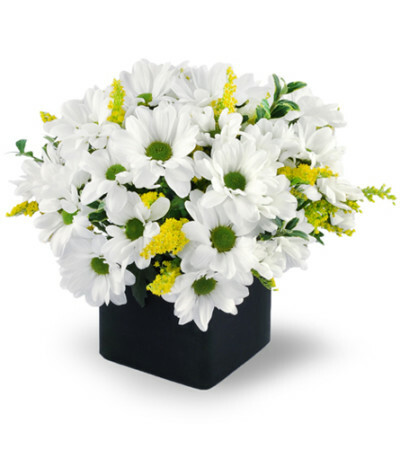 Cheerful daisies are arranged with solidago and oregonia in a cube vase. Flowerdale by Patty is wonderful. No hesitation in recommending them! I ordered daisies to send my mom for her birthday and the bouquet came out beautiful! The flowers were, shall I say it... ‘fresh as a daisy’ lol I’m always a little leery about ordering flowers online because I’ve been disappointed by the quality and price of other companies before but now I will always use Flowerdale going forward. Flowerdale by Patty has sent the most beautiful bouquet I have ever seen for my grandmother's funeral! I am from out of state and dont know amy florists local to my grandmother but decided to call Patty and I am SO SO happy I did! As you can seen, the spray provided for her was by far the most stunning arrangement on display. Even the funeral director said that they were impressed by Patty, and they see a lot of flower arrangments, so that says something. Then when we got home from the viewing, another arrangement from family all the way in Australia, were also from Patty. And what a beautiful arrangement that was too! 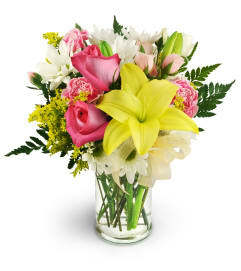 Both bouquets are full of fresh vibrant flowers with beautiful fillers, and arranged perfectly. My grandmother loved flowers, and I asked Patty yo customize one of her arrangememts to include my grandmother's favorite lillies and she did not disappoint. I was so proud and happy to have these on display. Thank you! Flowerdale by Patty is a Lovingly Florist in Huntington Station. Buying local matters. Discover how Lovingly supports local florists. Copyrighted images herein are used with permission by Flowerdale by Patty.